Are you searching the internet for the best winter cover for your in-ground swimming pool? 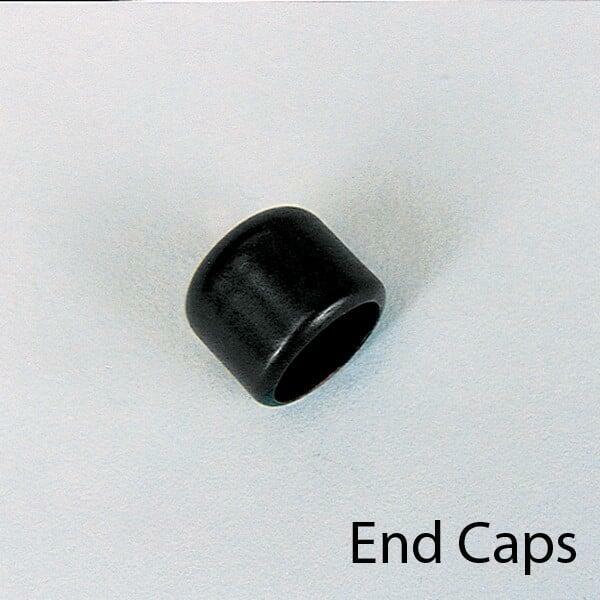 Have you been disappointed with safety swimming pool covers in the past that fall apart after one hot or cold season? 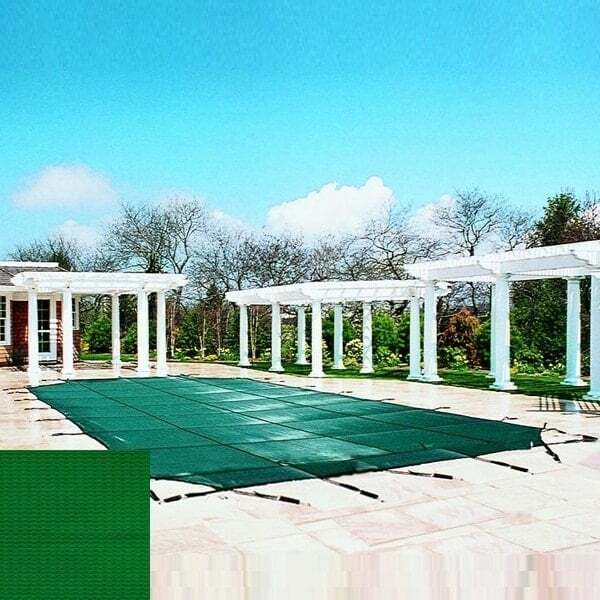 Bring home the strongest safety and winter cover available today with the Grecian Pool Cover with Solid Green Material from Coverlon and Family Leisure. Reduce the amount of chemicals and water that burns up in the sun with this cover, or use it in the winter to prevent debris such as leaves and branches from entering your pool. Regardless why you need it, this pool cover will protect your swimming pool and the water in it; the solid green vinyl-coated polyester material does not allow water to seep through, so you will need a pump system to prevent rain water and melting snow from building up on top of your swimming pool. Solid Green Material: Coverlon's solid green in-ground swimming pool cover is one of the best safety covers available on the market today. Why? It is built with heavy usage in mind, so Coverlon directly addresses to two largest issues facing covers: impacts and the sun. Each sheet holds additives that will resist ultra violet rays from the sun to prevent color fade. The polyester material of the cover itself is coated in vinyl, creating a super-strong, yet lightweight, material (most manufacturers simply laminate their covers in vinyl). These solid color Coverlon pool covers are not permeable, so a pool pump is required to keep water from building up on the top of the cover. Fast & Easy Installation: Each Coverlon Safety Cover offers an exceptional fastening system that includes easy-to-install springs and anchors. This system includes stainless steel springs and a buckle mechanism that is designed to adjust without much effort. This will save you time and allow you to avoid frustration with your new pool safety cover. Everything Is Included: Coverlon includes everything you need to protect your pool from leaves, debris and curious neighborhood children in each pool cover package. This includes tools, keys, springs, anchors, the cover itself, instructions, warranty information, a care guide and even a storage bag. Protect your pool without multiple trips to the pool supply store! 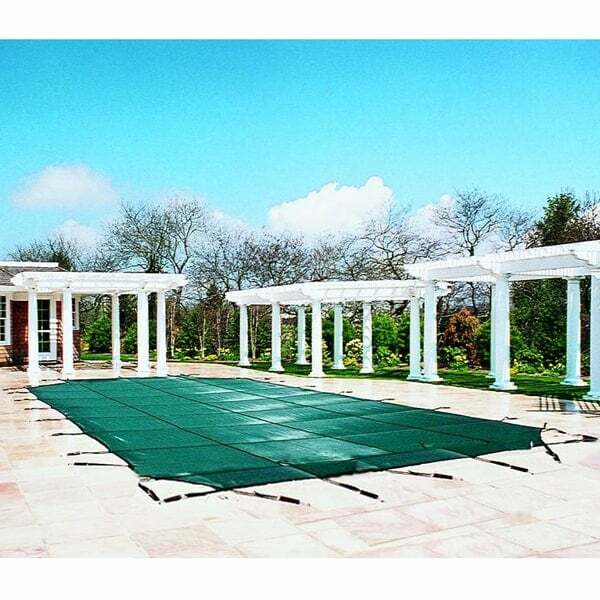 Crisscross Double Webbing: Obtain the strongest cover available with Coverlon's double-webbed pool cover. Notice the black straps the crisscross these safety pool covers? 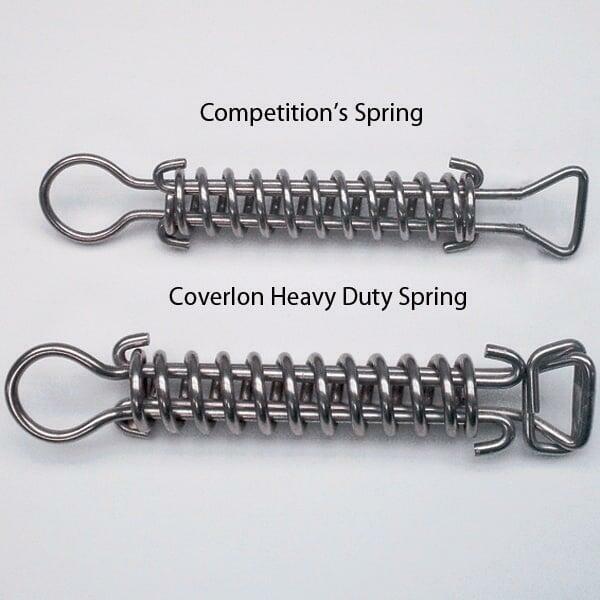 These straps create a strong web with a tensile strength of nearly 4,000 pounds per square inch that adds to the overall durability of Coverlon covers. 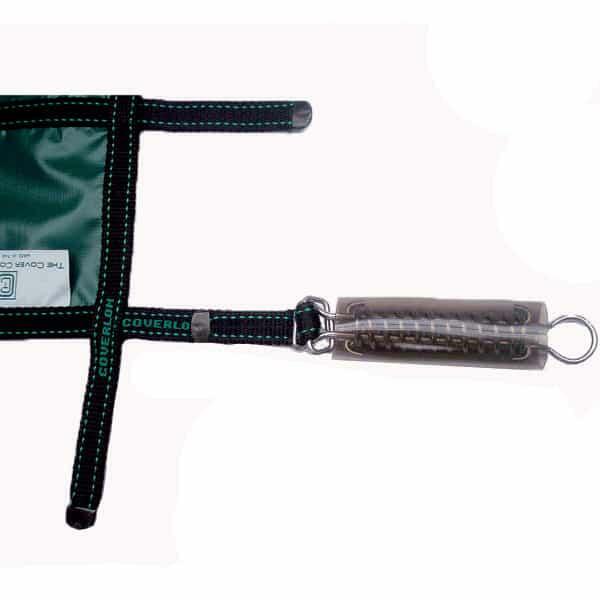 In addition, each strap is stitched into the cover on both the top and the bottom with a triple stitch, ensuring it will endure and stay resilient. Quite literally one of the strongest safety covers on the market today! 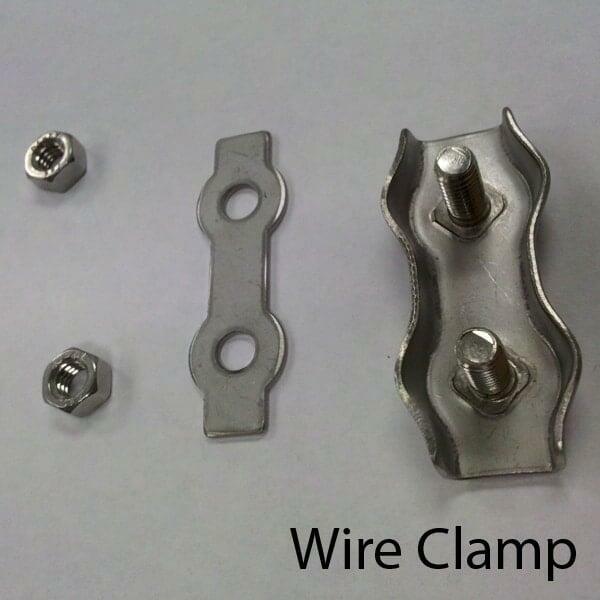 High-Quality Hardware: The springs, anchors, end caps and other hardware is all high-quality. Each spring is made in the USA and offers a special design that showcases a special bend at each end that eliminates gaps between the cover and the decking. 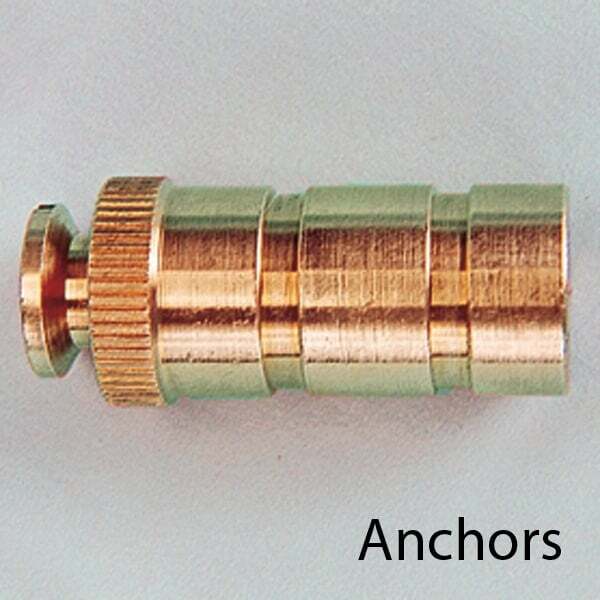 The anchors and end caps are made from brass that is non-corrosive, and each cap is produced by a machine that will prevent the webbing from coming apart.